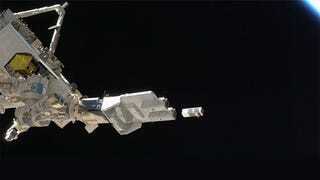 The International Space Station has a cannon that launches tiny CubeSat microsatellites into orbit. Most of the time, those launches are triggered by human scientists on board or back on Earth. But this week, the ISS launched two CubeSats entirely on its own. This is how the uprising begins. Yes, on Thursday night, ISS commander Steve Swanson was loading blood samples into a freezer when he noticed the doors of the CubeSat launcher were open. Swanson alerted mission control in Houston, which confirmed that two CubeSats had been inadvertently released. It's not the first time this has happened: A NASA status report shows that two other CubeSats were unintentionally released on August 23rd. That means that, of the 12 CubeSats launched into orbit so far, one-third of them got impatient waiting for permission, and just launched themselves. The CubeSats, made by Planet Labs, are tiny devices roughly the size of a well-stuffed foot-long cheesesteak. The plan is to launch 100 of the baby satellites into orbit to gather detailed, real-time imagery of the Earth below and make it available to anyone on the internet. You can read tons more about Planet Labs' tiny satellite program here. The first batch of 32 CubeSats, known as Flock 1, was delivered to the ISS in July. The plan was to launch them in an orderly fashion over the next several months. Clearly, the ISS had other plans. It's a good thing the CubeSat cannon isn't weaponized.